Review the 360 Degrees Security Lite Mobile security app! Why is this app #MadeForIndia? With features like Android Speed Booster, Junk Cleaner, Intelligent Power Saver and Exclusive Booster, this app will keep your phone functioning as new for a long time. What’s more, all this comes to you at an incredible price of Rs. Zero! Yes, your phone can be a secure, mean machine for free with this mobile security app, made specially for smartphones with less than 1 GB memory! BlogAdda is giving tech bloggers the chance to review the 360 Security Lite App on your Android smartphone. 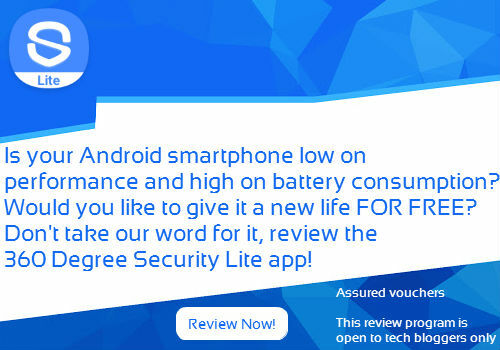 This review will not only introduce you to the world of Lite smartphone security, but will also earn you an assured voucher worth Rs. 1500! Register for the #MadeForIndia activity by clicking on the button below. Once shortlisted, download the 360 Security Lite App on your Android phone and try out its amazing features. Post 4 tweets and 2 Facebook statuses about the app with #MadeForIndia. Submit a blog post with at least 4 screenshots of the app within 7 days of installing the app. Once we validate your blog post, we’ll send over your assured voucher worth Rs. 1500! This activity is only open for technology bloggers from India. The blogger must have an Android smartphone through which they can review the app. Please embed the below video in your blog post for it to be considered valid. Register now to discover the power of a light and powerful security app for your phone!